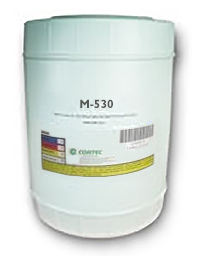 M-530 is an oil-based package of corrosion inhibitors for hydraulic or lubricating oils. M-530 is a rust preventative product, which provides excellent protection during operating conditions and intermittent operations. M-530 is very effective for mineral and synthetic oils: naphthenic, iso-paraffinic, PAOs, among others. For hydraulic and lubricating oil systems in intermittent operations, add M-530 to oil at a concentration of 2-5% weight. Available in 5 gallon plastic pails (Cortec Product # 14503512) or 55 gallon metal drums (Cortec Product # 14503513). 5 gallon drum weighs 50 pounds and ships under our standard shipping rates. The 55 gallon drum must be shipped by truck. We will provide you with a freight quote before we ship this product. M-530 should be sealed before storage. The shelf life is up to 24 months.